A few years ago my sister-in-law, a middle school counselor, asked if I would be willing to participate in a Career Day event she organized at her school. She told me I had a really cool job and that the students would be excited to learn about what I do and how I came to work in the archives field. 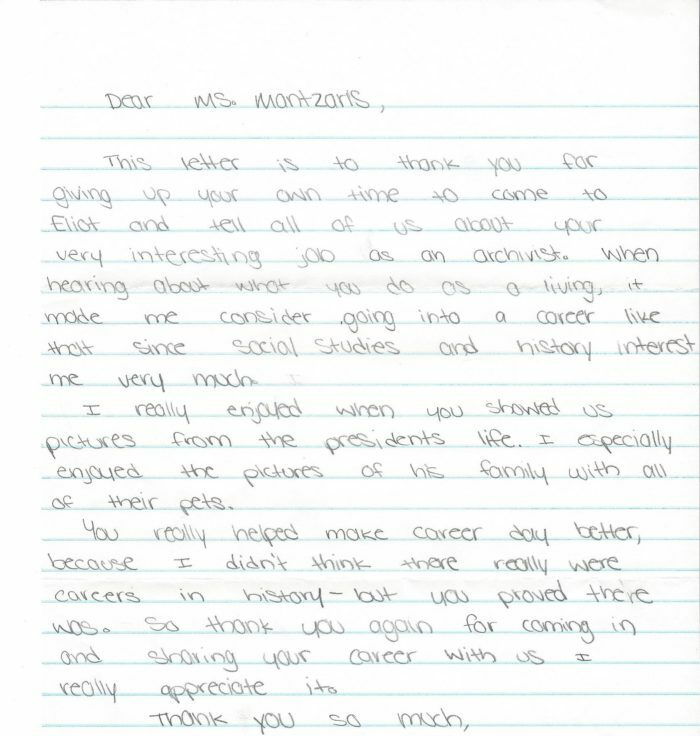 Because flattery will get you everywhere and being an archivist is very cool, I said yes; and for the past three years, I’ve been a participant in the Career Exploration Speakers Program at a middle school in Connecticut. School Counselors, Kris Mantzaris and Sarah Fusaro, pull off an impressive program introducing the eighth-grade class to important life skills and a variety of professions and occupations that may strike the students’ interests. In the week leading up to the speakers’ program, students engage in activities and discussions on topics related to contemplating their future grownup selves. They learn about potential career paths, the realities of college and/or work life, balancing a personal budget, and even the prospect of moving back in with their parents. At the end of the week, career speakers are invited to present on their experiences. Students have the opportunity to hear from a range of professionals, including doctors, lawyers, engineers, music therapists, electricians, producers and creative directors in television programming, officers in law enforcement, archivists, and many more. A police dog usually makes an appearance. It may seem daunting to compete with a police dog, or to stand in front of four groups of approximately 35-40 eighth graders as they rotate into the classroom to listen to you talk about yourself. But every year, I am pleasantly surprised by the students’ enthusiasm, perceptive responses, and intelligent questions. 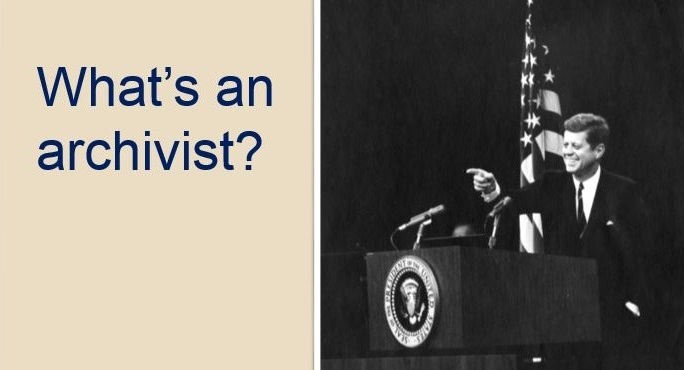 I usually begin my presentation by asking how many in the room are familiar with the word archivist or archives, or see if anyone would like to tell me what an archivist does. The kids never disappoint, responding with answers like “You organize data,” and “Is it about preserving something for the future?” I try to draw upon the students’ experiences with primary source materials and their school’s library/media center, discussing the similarities and differences between archivists and librarians. I emphasize the uniqueness of archival holdings and how objects in our care therefore require everyday preservation from climate-controlled stack areas to secure reading rooms. Another of my presentation slides lists several types of archives and record-collecting organizations; and ever since one of the teachers mentioned a couple years back that their town has a historical society, I make sure to encourage them to visit the Clinton Historical Society. 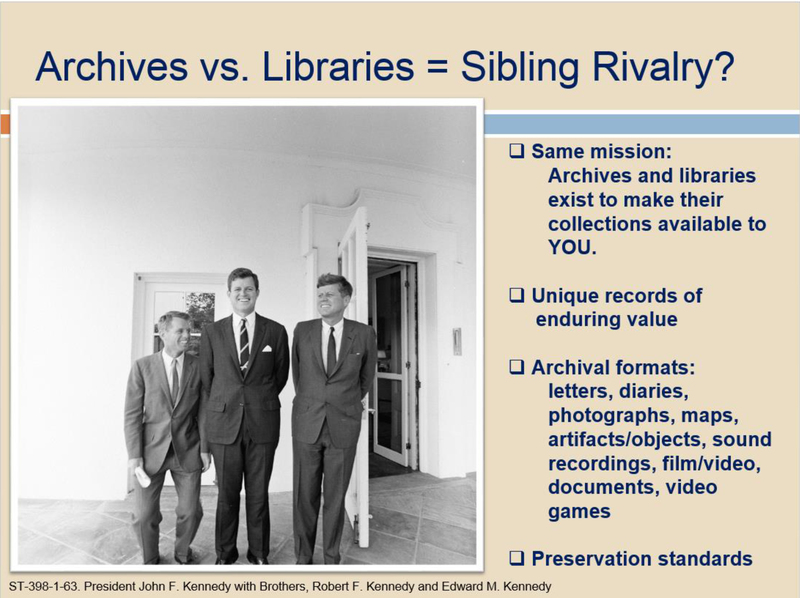 This slide also leads to conversations about their own personal archives. Many students have shared stories about the family photo albums and scrapbooks they keep. At this point, I drive home the importance of archives and why we should bother saving this stuff for 50, 100, or 1000 years. Archives validate our experiences; they tell our stories, and protect and preserve the knowledge of our accomplishments and our history – whether it’s personal history or public history. The job of an archivist is to collect, organize, preserve, and make available these important materials. 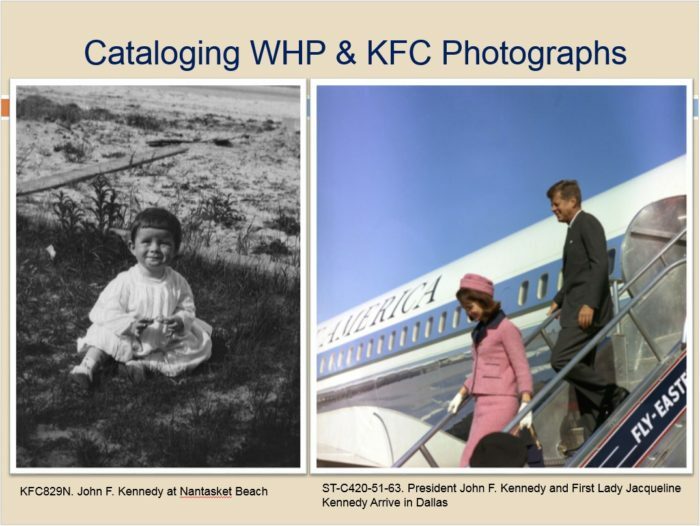 These statements segue nicely to my specific work at the John F. Kennedy Presidential Library & Museum as a metadata cataloger of photographs from the White House Photographs collection and the Kennedy Family Collection. I talk about how institutions like ours enable the public to access collections remotely by creating digital copies of original materials and publishing them on the Internet in the form of digital archives. The way in which we can provide access to these digitized materials and facilitate their search and discovery on our website is through the use of metadata. Many of the students, however, have gone off script and asked some excellent questions that open up new discussions on archival work, such as collection and acquisition policies, and the challenges of digital preservation. I have been asked: “What makes something valuable or worth saving?”; “How do you come to get the things in your archive?”; “Do you worry about losing information or not being able to open a digital photo years from now?”; or “How long does it take from start to finish to put a photograph online?” Other students share personal connections. This year, one girl shared a story about meeting former President Obama’s Secret Service agents on Martha’s Vineyard and we bonded over being able to identify the special pins the agents wear on their suit lapels. Career Day is always full of memorable moments and I look forward to next year’s event; but my absolute favorite thing about it is receiving thank-you letters from the students. I’ll end this post by sharing a couple of the letters from last year’s class. Who knows? Maybe I have inspired a future archivist or two.